There are two kinds of gardener responses to the first fall frost. Some of you are probably sick of garden tasks and are quite happy for the cold weather to come and put your garden to sleep. (This is probably the more healthy reaction to the inevitable loss of summer.) Then there are the obsessive people (like me) who will spend days protecting every single plant in hopes that this current frost is just going to be a fluke. We obsessive types figure that (previous data to the contrary), there's bound to be another month or two of Indian summer to enjoy...if we can just ease our gardens through that one bad night. 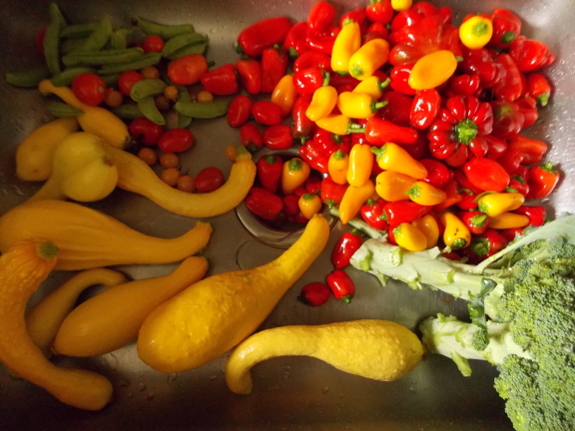 ...and this photo shows some of what I picked in the two hours of daylight left when we got home (with a frost predicted for that very night). I plucked figs and raspberries and tomatoes, then ran out of time and just cut the whole pepper plants to be managed inside the next morning. And, after all that, it didn't quite frost. Yes, one of my outside thermometers read 32 degrees on Sunday morning and there was a little bit of ice in the wheelbarrow, but only the basil and summer squash looked nipped and I saw no frost on the ground. Still, I was glad that I'd taken the time to bring in vegetables curing on the front porch, and that I'd picked the last summer treats. 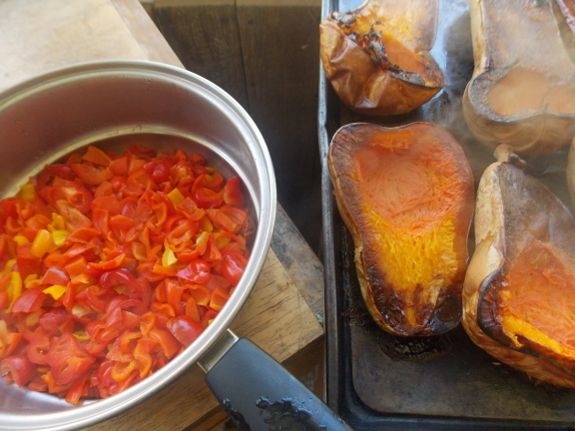 The baskets full of food gave me an excuse to fire up the oven and bake some troubled butternuts, taking a bit of the edge off a cold morning. With similar temperatures Monday morning, though, Huckleberry required an actual fire in the wood stove, so I guess I failed in my other obsessive campaign --- to hold off on fire-building until after the first frost. What kind of pepper is that with many lobes? (First picture, center of the NorthEast quadrant). It looks very attractive. P.S. I often do lots of attempted heroics, such as emergency hoop houses over the peppers, but mostly lots of blankets. We lost our basil a couple weeks ago, but are looking like a deeper frost this weekend. I may just be protecting the dahlias at that point. Jim --- That particular one is Round of Hungary. 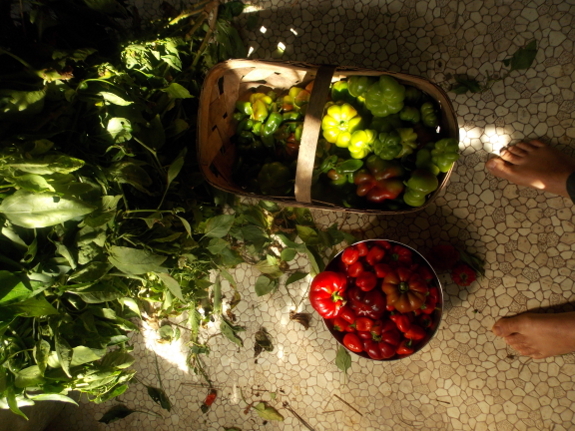 It's pretty, but not as productive or tasty as the lunchbox peppers we also grew this year. If you're looking for a good pepper that size and shape, I instead recommend Tangerine Pimento, which is an heirloom (yellow-orange instead of red, though) and tastier.